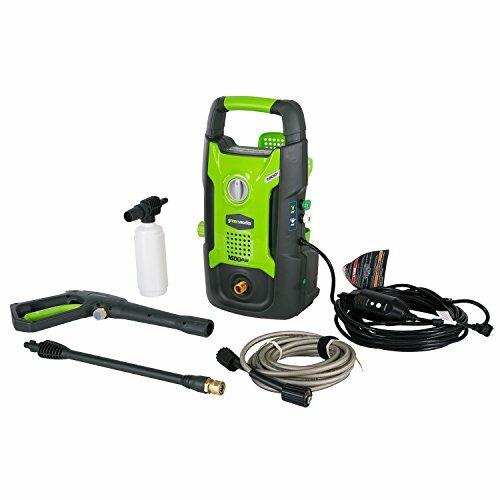 This electric pressure washer from Green Works costs among the least of our tested batch, and in certain ways you get what you pay for. It comes with only three nozzles: turbo, soap, and a 40-degree nozzle that’s suitable for light cleaning. Its included soap bottle is the least convenient design because it attaches to the nozzle assembly. The hose must be screwed in at both ends. And there are wheels but with a catch–you need to either bend way over or carry the unit by its handle. The trigger lock must be manually set. The power cord, as with most electrics we’ve tested, needs to be manually wrapped around the unit. Moving around can be cumbersome. Very easy to operate, just plug it in. Easy hose storage. Cord is very easy to wrap and store. Wand not as convenient to remove. Easy to use and read on-off switch. The GreenWorks GPW1600 is part of the Pressure washer test program. In our lab tests, Pressure washer models like the GPW1600 are rated on multiple criteria, such as those listed below. This pressure washer from Green Works is electric-powered (120v) and claims 1,600 psi max with 1.2 gpm. It comes with three replaceable nozzle tips and solid wheels. It weighs 17 lbs.